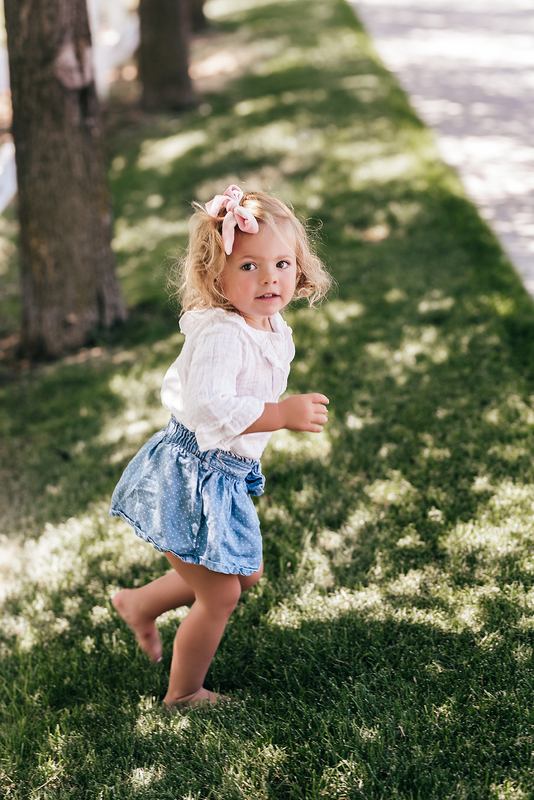 Isla’s Top: Old Navy (similar style here) | Isla’s Skirt: Gap (similar style here) | Isla’s Boots: Hunter | Isla’s Bow: Wunderkin Co. Happy Thursday!! Isla and I wore this look last week while we were out and about running errands! 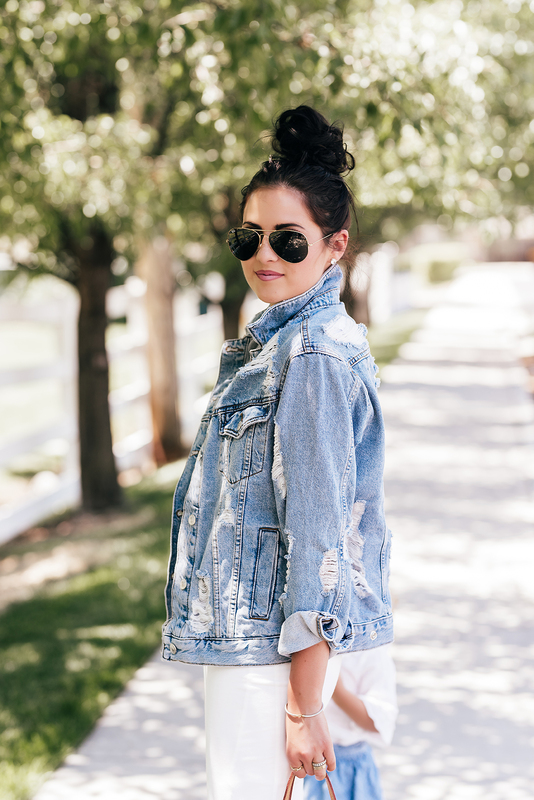 You’ve probably heard me talk about this denim jacket WAY too much, but it’s one of my absolute favorites from the Nordstrom Anniversary Sale. I can’t get enough of the oversized, distressed look! What an awesome look (the highlight are those aviators – my absolute favorite ray-ban sunglasses!). Love this look! The destroyed denim is a great compliment to the feminine dress. That denim jacket is perfect layering or add on piece! I really like its length and distressed style. 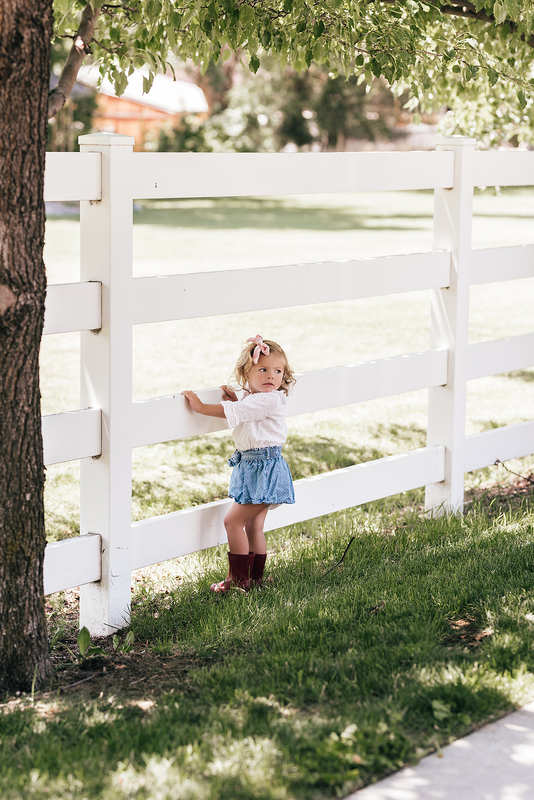 Love Isla’s little outfit, so cute that is coordinates with yours! You both look so cute. Love pictures like these. This look is cute & casual! I love that jacket, brings the whole together! I love this outfit! I’m definitely recreating this outfit this weekend! Love that denim jacket and Isla’s outfit is adorable!! So darling! Love the relaxed fit of that denim jacket!! That denim jacket looks SO good on you! And how cute is little Isla! This is so pretty!! Love how you and Isla coordinate! This is such a cute casual way to rework that white dress! Love it!! Two super cute and stylish girls!! Loved your trashed denim jacket! I love the top knot and denim jacket to make the tighter dress more casual. So cute! Where did you get the blue swimsuit top and blue and white bird sarong you wore in New York? I love it. I’d love it if you posted an outfit with the pink Sam Edelman Raisa flats you bought at the nsale!!! This is SUCH a cute outfit, I love these casual look inspirations!! Loving this distressed denim jacket! One day I want to have that LV bag. I love a dress and denim jacket look! How did you do your bun?? Are the earings the gold vermeil or sterling platinum? This denim jacket is on top! Love the look! Super casual yet chic! You should do a tutorial on how you do your cute messy buns! I love them!! Thanks for the suggestion Maddie! !